Oh boy, have the last couple of months really taken me away from here & pretty much actually doing much knitting. 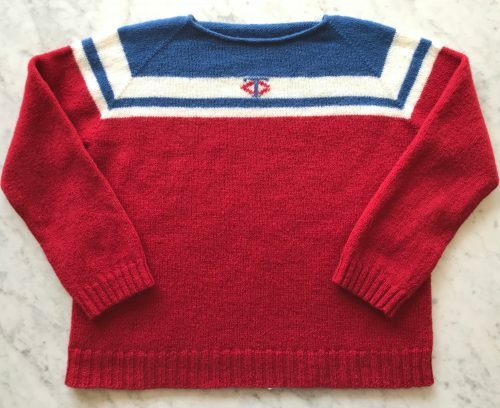 I did though finally finished my MN Twins Opening Day Sweater! 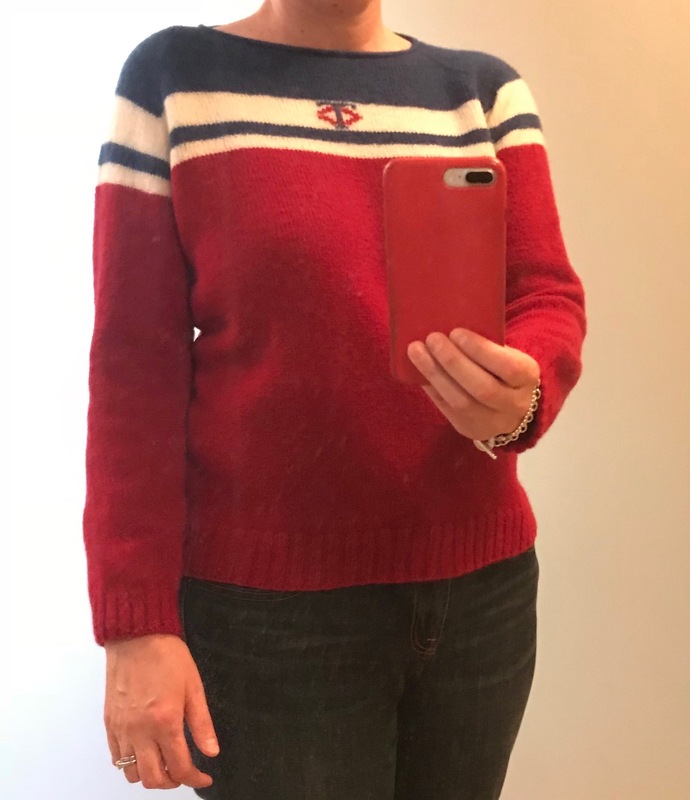 I started this sweater with the hopes for wearing it for the cold spring games here in MN when the temps are in the 40’s and 50’s, but didn’t finish it until just last week and not it is in the 90’s. That’s ok, we know there will be cold games again in the fall. Notes: On the striped top, I did about 40 rows of delta, 13 rows of white, 6 rows of delta and 6 rows of white before switching to red. 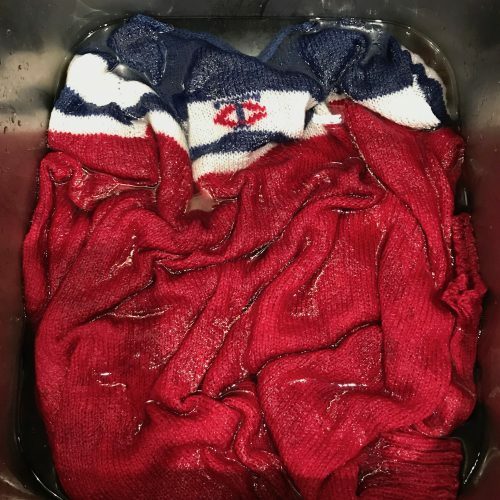 The Twins logo is duplicate stitched on. The cuffs and hem are worked in k2, p2 ribbing and bound off using Jenny’s Surprisingly Stretchy Bind-Off (which I love!). The collar is finished with an i-cord bind-off. I blocked the sweater in cold water with a really big slug of white vinegar in it. I found this is the best way to keep the red from bleeding into the white. A few people on Instagram were really worried about bleeding when I posted this picture, but my white stayed perfectly white! I really liked the fit, but after soaking and squeezing out the water, I realized this sweater had grown to be huge! It was going to be completely unwearable on me, so I took a chance and threw it in the dryer on low for about 20 minutes. When I took it out it had felted a little, but was still damped. I blocked it from this point and let it dry flat. The result was a sweater that fits me just like I wanted, a relaxed, casual fit, but not too oversized. It is not felted so much that it has lost any stitch definition or anything, but the fabric is a little closer, the gauge went down about 1 stitch per inch. 11 months ago by Kat in Knitting , Needlecraft | You can follow any responses to this entry through the RSS feed. You can leave a response, or trackback from your own site. Nautical look! Definitely a great look. Great sweater! When I’m blocking these days, in addition to the white vinegar I add one of those Color Grabber sheets to the water. Can’t be too careful, right? I’ve seen other people use those, but have yet to try them. I should pick some up. That is an awesome sweater! So appropriate for spring baseball in MN! Just beautiful! I am always leery of a raglan sleeve on me — this looks like a great possibility. You are so creative! I’ve done a few top-down raglans now & like the fit on me. The best thing is that I can try on as I go and make changes as needed. Beautiful sweater and good save getting it to fit the watery you intended. You never cease to amaze!